Summer is near. Fun in the sun is about to commence. Nothing wrong with that, right? After all, there are a lot of benefits to getting a bit of sun – vitamin D, increased melatonin, stress relief, and boosts your mood. However, sun exposure does have its dangers. And it’s best to be aware of what you should and should not do when the heat is on to protect your property. Sunlight can degrade the materials that make up your home. It can cause plastic to fade and become brittle. It can cause untreated natural wood to also become brittle and fall apart. Sunlight can also cause you to repaint your home more frequently due to discoloration. Even your furniture such as carpet and fabric can fade when continuously exposed to sunlight through the window. Obviously, there’s no way we can live without the sun. But there are things we can do to help protect ourselves and our homes from the perils of overexposure. Use sunscreen often. The higher the SPF, the more protection you will get. Look for sunscreen that specifically blocks both UVA and UVB rays. Make sure to apply sunscreen at least 30 minutes before you go out in the sun and do so generously. Reapply every 2 hours, especially if you’re swimming or sweating. Avoid sun exposure between the hours of 10am to 4pm. These are when the sun’s rays are most intense. Cover up. Wear sun protective clothing and that includes your pet. Get a broad-brimmed hat to cover your face and make sure to wear sunglasses that block UV rays. Take a break. Don’t stay under the sun for long even if you’re covered and wearing sunscreen. Go back inside or stay in the shade. If you’re at the beach, you can use a tarp to create a temporary shelter from the sun while still allowing air to freely pass through. The best way to avoid unwanted sun contact on certain parts of your home is to provide a shading device. Just like you, lessening your home’s exposure to the sun can do wonders for its facade. This could mean extending the existing eaves, adding an awning or trellis, or even placing trees strategically around your home. Of course, doing any of these will cost you a pretty penny. If you can’t afford to shell out much, you can go the simple route – just use a high quality tarp as a shading device. Tarps aren’t solely for covering damaged roofs, you know. You can use it to create a makeshift awning which can protect your exterior wall surface as well as some of your belongings that are near a window. Even better, it will provide you with a new place to hang out during the summer. 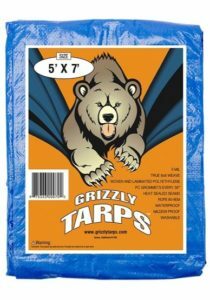 Just keep in mind that the tarp you use must be UV proof so that it also has some degree of protection from the sun. We love it when the light goes through the window and brightens up our space. Not so much when it causes furniture like carpets, rugs, and upholstery to fade. Applying UV-blocking film can prevent 99.9% of UV rays from entering your home while still allowing light to come in and without obstructing your view. However, this can be very expensive with the rate starting at $4 per square foot, including installation. If this is not ideal for you, you can always go back to good ole fashioned window shutters or blinds. 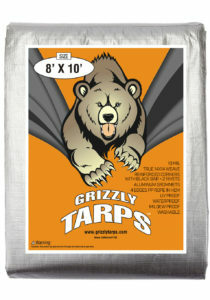 Have we mentioned tarps, yet? With a little bit of DIY, they can serve as outdoor curtains for your windows, patios, and decks. 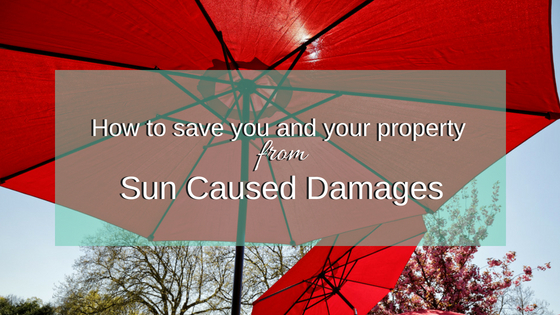 Your roof is the most vulnerable to sun damage because it takes the brunt of the heat. UV light is just one of the culprits for causing a roof to deteriorate after a hot summer. Putting reflective coating on the roof can help prevent damage due to UV rays and IR radiation. Look for a coating that is highly reflective and emissive because it will help redirect sunlight, lowering the surface temperature of the roof (i.e keeping it cooler). Going out and getting active are very good things. Staying indoors all the time isn’t healthy. But it’s also important to ensure that you’re protecting yourself and your property from the effects of too much sun exposure. Like all things in life, moderation is key. That goes for the sun too.